Pay no attention to the current epic quest list, I'm going to be redoing that. I'm an old school D&D nerd (1st & 2nd edition AD&D), LOTR (books) fan, and StarWars fan. By day I work as a data analyst for a website and data aggregation company. I started practicing Taijiquan in 2009 and Yoga at the same time. While my practices have lapsed the last few years I'm currently trying to get back into decent shape. I also run a small Historical European Martial Arts / Western Martial Arts club. We focus on American Military Saber (Civil War Saber), Irish Stick Fighting, the Classical Pugilism of Colonel Thomas Monstery, and an Eastern European / Turkish sword and buckler game called Matrak. Many times I find myself having to be the instructor for the club, so I need to be able to step up to the role. Worse, I'm the heaviest I've ever been in my life (195lbs @ 5'9" tall) and am in need of replacing all my pants with a larger size. I WILL NOT BUY BIGGER PANTS!!! One of my ultimate goals with training is to be able to compete at least one or two times in the HEMA tournament circuit and become a HEMA Alliance certified instructor. 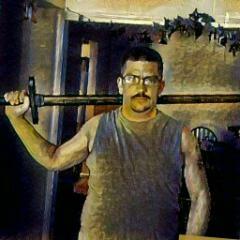 However, training in general, and swordsmanship in particular are spiritual pursuits for me. As far as race and class go - I'm either human or chunky half elf (I was a skinny kid) and my class would be a cross between Druid and Monk, but I very much lean more strongly to druid. Well hello im still relatively new myself....but welcome. I too also was a big fan of 1st and 2nd addition d&d. Have you checked out the rest of the forum. Ie. Classes, planning, etc. If not you will find a crap ton of support here and help as well. Count me in on the AD&D 2nd edition too (still have a rather large bookshelf full of stuff although no longer have a group to play with). They have online groups that play.